April 14 (Sun. – Easy afternoon loop hike in Hanover(NH) from Kendall Riverfront Park past Kendall and Storrs Pond, then through interesting Rinker-Steele Natural Area. 2-3miles, with a few hundred feet elevation gain. April 28 (Sun.) – Easy afternoon climb of Lyme Pinnacle, Lyme(NH). Hike through field and forest to open summit with old chimney and great views. 2-3 miles, with a few hundred feet elevation gain. May 5 (Sun.) – Easy afternoon climb on Signal Hill, Lebanon(NH), through fields and woods. Views. 2-3 miles, with a few hundred feet elevation gain. May 27 Mon.) – Walk the trail around lovely Eastman Lake, Grantham(NH). 5 miles, essentially level but rough in spots. Moderate. If interested in any of these, call the Leader, Peter Hope, at (603)863-6456. On Columbus Day 4 of us drone to Franconia Notch. in the Whites, on a day when mist blocked views of the mountains. We started by walking out on the old Route 3 bridge. We did catch a fleeting glance of the Greenlreaf Hut area, and enjoyed a rainbow in the direction of Bethlehem. We started our hike proper from the large parking lot across from Peabody Slopes ski lifts. We were fortunate as the major summer parking lots were full. The Park was running a shuttle bus for visitors, which we did not need. We took a loop trail, first climbing to Bald Mt.. The view from the steep ledges at the top was blocked by fog, but the company of other hikers was good. We then descended to the col and climbed the western hill, which has views even more limited than usual, From there we went down to the short spur trail to the top of the Artist’s Bluff cliff. From there we did get a great View of the Notch and of Eagle Lake, although the mountains were still in the clouds. After taking the Link Trail back to our cars, we discussed what to do next. The original plan was to hike to Georgianna Falls, from a side road off US-3 in Lincoln. As time was getting on, we instead parked at the Basin, and hiked the Pemi Trail to the Little Fume and the confluence with Whitehouse Brook. Water levels were too high to consider continuing, so we retraced our step. instead. We all enjoyed the day greatly, even though the weather was not ideal. It’s great to get out! On Sunday August 19 five of us climbed Potash Mt. a small peak off the Kanc. We went up the trail, with only minor problems at the stream crossing, then came down diverting to the Forest Service road that avoids it but that does entail a short road walk. From the first overlook we could see south to Mts. Passaconaway, Hedgehog, Square Ledge as well as Chocorua and the 3 Sisters. The views from the open summit were even better, towards Carrigain, the Pemi. Wilderness, and the peaks to the north and east. The trail was fairly rooty and steep in places, although it also featured some level stretches as well as friction climbing on rock near the summit. Altogether, we had a great day! On Sunday August 5, 11 of us hiked a loop from the Moose Mt. Lodge area, Hanover, NH. We first visited attractive Mill Pond, as well sites of old mill dams a little below. we did have some trail finding problems, but we eventually reached the our goal the upper Pasture. Several of us went to the ledges on Moose Mt. Ridge, others rested and enjoyed chocolate under the shade of a tree. We descended via the Pastures, enjoying a great view toward Vermont from above Moose Mt. Lodge. 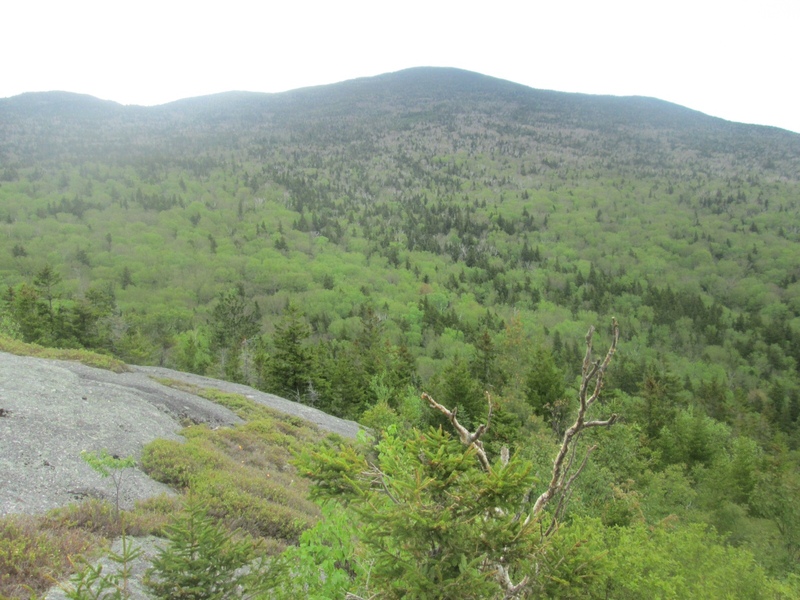 On Memorial Day 9 of us climbed to Bald Peak on the western slope of Kinsman Ridge in Franconia(NH). The view from the flat open ledges was fantastic! On the way up we visited a lovely waterfall and gorge. It was an exceptional outing for us all! Om Sunday May 6 three of us hiked through conserved woods in Hanover(NH). We started from Goodfellow Road on Huntington Hill and descended to lovely Slade Brook which we followed down to River Road.We passed many waterfalls along the way. There were no unpleasant insects. A great time was had by all! On Presidents’ Day in 2018 4 of us ventured into a Winter Wonderland on the Colette Trail in Enfield(NH), which closely follows Bicknell Brook. There was enough open water to make the brook lovely, both in its quietly running sections as well as in its waterfalls, of which only the largest was still covered in snow and ice. We will return, as this trail is so appealing in all seasons! On Sunday October 22, 2017, 10 of us explored the Hope Forest in Danbury(NH), an attractive wooded hill, which my family gave to the Forest Society. We followed dirt and woods roads, and did a steep off-trail climb between 2 sets of woods roads. We did venture too far north, climbing Moulton Hill, but were able to correct course by descending a skid road. We finished the hike by visiting waterfalls at a former mill site, now a swimming hole. On Sunday October 8 there were few signups for the planned hike to Cockermouth Forest in Groton(NH). But 2 of us, both experienced hikers, decided to go anyway. We hoped the rains would abate, but they were still upon us when we arrived at the parking area. We had originally planned a loop over Mt. Crosby and Bald Knob, but we went to Plan B – a hike to Little Pond instead. We thought that the rocks on the summits would be too slick, and that there would be no views. We were pleasantly surprised at what a great destination Little Pond was. We climbed gently to an attractive spruce forest, then continued to a ledge just above the lovely pond, which is clearly gradually filling in to become a bog. And just as we arrived there the rain stopped, succeeded by warm sun! Altogether, it was a good trip. On the way home we stopped briefly at Sculptured Rocks in Hebron, where spectacular potholes were carved out by water eons ago – much more spectacular than more familiar ones such as at the Basin in Franconia Notch. On Sunday September 10 three of us greatly enjoyed a loop hike over Mt. Pemigewasset in Lincoln(NH), just south of Franconia Notch. We climbed from a hiker parking lot up the Indian Head Trail, to the open summit ledges with great views south and west (and more limited ones in other directions). After lunch we descended to the bike path near the Flume, then followed old roads south past the Indian Head Resort. We only had a very short walk along US-3 back to our cars.And we hiked at guidebook time – not bad for 3 seniors! On Sunday 27 August 6 of us did a morning hike in Huntington Hill / Slade Brook area, Hanover(NH)., through attractive woods, fields, and along a lovely brook nestled in a gorge. Recent logging resulted in a few detours, but we all had a great morning! On Tuesday 15 August 7 of us explored a very attractive 5k multiuse trail system designed by John Morton, located on a lovely wooded hillside in Taftsville(VT). On Sunday 30 July we enjoyed an afternoon hike at Cook Preserve, New London(NH). Highlights included ttractive woods, views, interesting rock formations. 3-4 miles, with a few hundred feet elevation gain. On July 4 six of us enjoyed a climb of Black Mt. in Dummerston(VT). The attractive loop is again open, since a recent land purchase by the nature Conservancy. 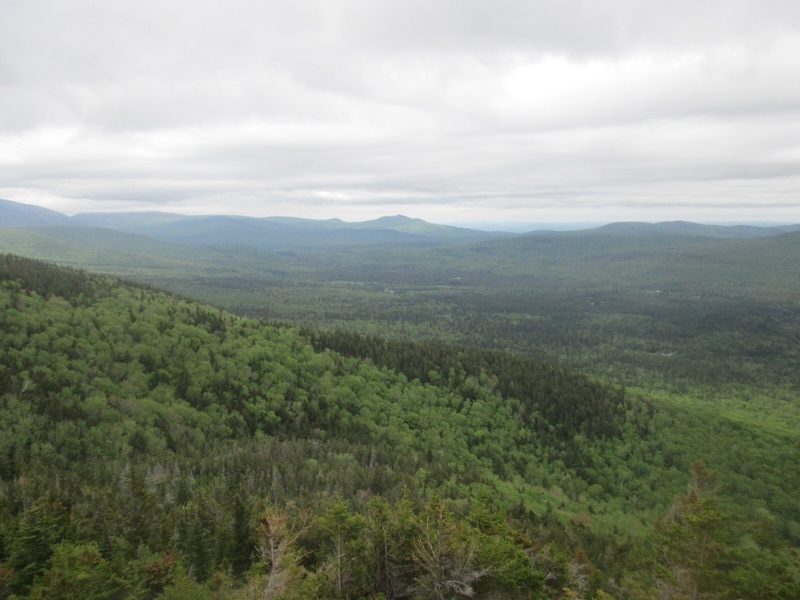 Highlights of the trip were a beaver pond, a lovely small waterfall, a snake, Beautiful Mountain Laurel and (limited) views from the summit ridge. On June of us climb Mt. Monadnock(3159′), Jaffrey(NH). We hiked a loop from the State Park, up to Cliff Walk and over Bald Rock on (and a little off) trails, then avoiding the summit crowds we explored open Pumpelly Ridge, with great views. 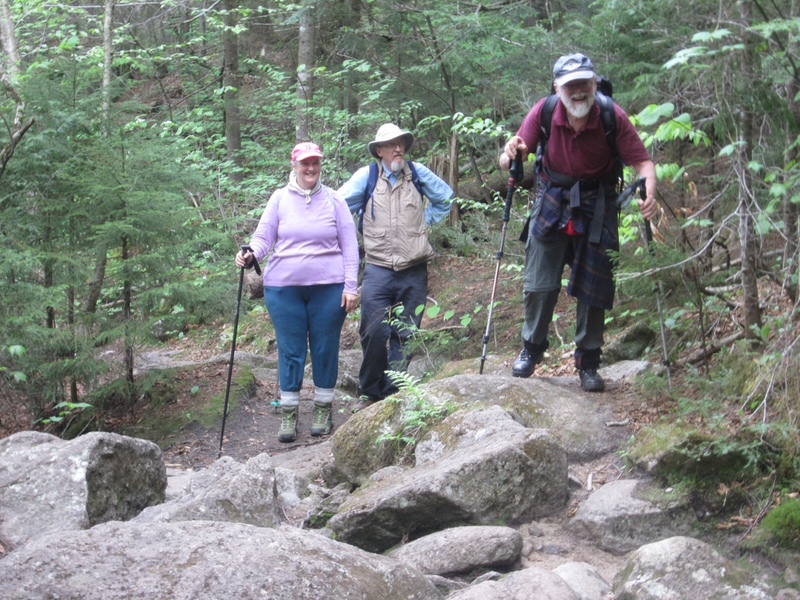 On June 8 of us explored Brookside Park, Grantham(NH), on easy trails through attractive woods and along a lovely brook. On May 28 five of us enjoyed a loop climb of Wright’s Mt., Bradford(VT), much on newer trails. . we explored Devil’s Den, an interesting and sporty rock cave and climbed to the Lookout with good views. All was great but for the blackflies! On Sunday April 30 four of us had a pleasant 4 mile walk in Moody Park in Claremont(NH). It was shorter than we had planned, as some trails were closed due presumably to persistent muddy conditions. The weather was a bit damp, yet we still enjoyed good views of Mt. Ascutney. And after the hike the weather worsened to a downpour, so it was good we finished early! On Tuesday April 18 seven of us walked at Hanover’s Pine Knoll Cemetery to a viewpoint above Mink Brook. After a little difficulty in finding the (unmarked trailhead) we then explored lovely South Esker, with its evergreen forest and Connecticut River views. On Tuesday March 28 2 of us snowshoed on historic Pease Road in the Trescott Lands in Hanover(NH), from Trescott Road to Dogford Road and back. On Monday January 16 nine of us enjoyed a hike in North Grantham, NHwe used traction, as there was more ice than snow underfoot. We climbed to Old Croydon Turnpike, walked north past attractive Chase Pond, and then climbed Little Mt. Washington, with god views from ledges. That was a great lunch spot, with bare rock and sunny skies. We descended past Leavitt Pond to old Route 10. The hike was 5.7 miles in length, with 900 feet elevation gain. On Saturday October 15 we helped with the Peak to Peak Celebration, Woodstock(VT), part of NPS-100. There was a 10 am morning climb of Mt. Tom led by Denis Rydjeski, and a 1 pm afternoon climb of Mt. Tom, led by Peter Hope, both Sierra Club leaders. There also were climbs of Mt. Peg, as well as a more ambitious climb of both peaks. It was great to be a partner with the Park Service for this event! Last year on Sunday October 4 we participated in an enjoyable and informative Outing to the proposed Jim Jeffords State Forest in Shrewsbury, VT. For details, go to the About Us page om this website. We are happy that this special land is now indeed a State Forest! Stay tuned for more Outings! 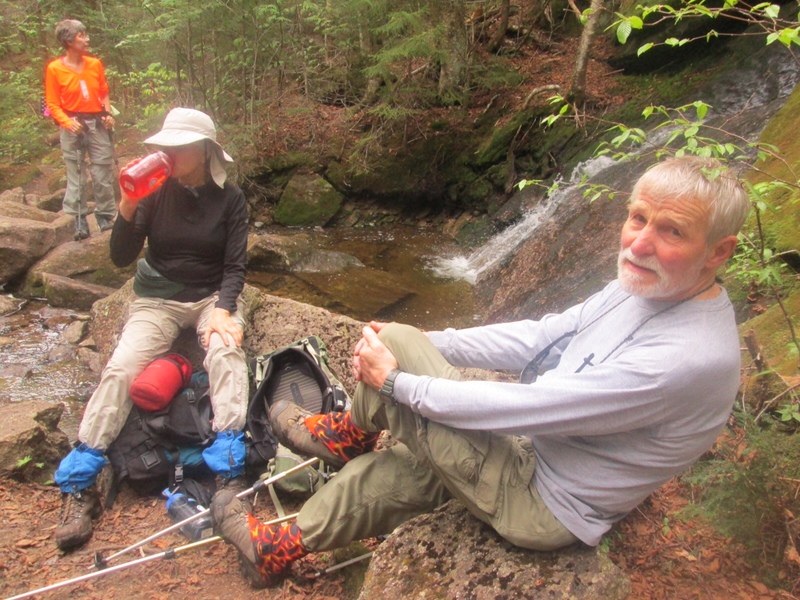 Outings Leader Peter Hope publishes a weekly listing of many trips in northern New England, in addition to Sierra Club Outings. If you’d like to be on his mailing list, contact him at phope@worldpath.net.